Microsoft wants to make upgrading to Windows 8 from older Windows versions easier and faster through online delivery, no product key entry for at least one installation method and a process that involves 82 percent fewer screen clicks. "Our aim in improving setup is to reduce the time from start to finish," Microsoft's Windows chief, Steven Sinofsky, said in a recent post on the Building Windows 8 blog. Windows installations have always been a pain, and even when they're easy the process can still take as long as four hours as my colleague Jeff Bertolucci mentioned during the Windows 7 launch. Microsoft hopes to improve its upgrade process to convince the more than 450 million Windows 7 PCs capable of running Windows 8 to upgrade. Not to mention the large number of users with modern PCs running Vista and XP that may be finally willing to try a new Microsoft OS. To make it easier to get started, Microsoft will favor selling downloads of Windows 8 instead of having users purchase a physical disc at a local retailer. This is similar to what Apple did with the release of OS X Lion. If online downloads aren't your thing, you can still purchase a Windows 8 DVD, but Microsoft is hoping more people will opt for the download option. Microsoft did not mention whether there would be a pricing difference between online downloads and physical DVD purchases of Windows 8. If you opt for online delivery, you will still be able to create a bootable thumb drive or DVD to install your new version of Windows. This might be your preference if you plan on backing up your files on another hard drive and then wiping your system to do a clean install of Windows 8. If you want to take the easier way out, you can start the upgrade wizard online and then complete the move to Windows 8 on your desktop. Microsoft claims this process will be "one continuous integrated experience from beginning to end." Even better, the easy install option doesn't involve entering an annoying 25-digit product key to activate your copy of Windows. Microsoft says it will embed the product key into the disk image you download during the setup process. Before you get to that point, however, the first thing Microsoft does if you start your installation online is to scan your PC to determine its compatibility with Windows 8. You can then read a simplified or detailed report on whether there are any upgrade problems with the apps and peripheral devices on your system. 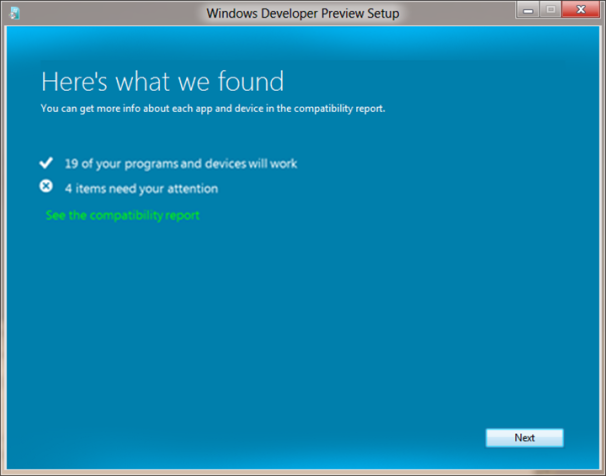 The compatibility scan also allows Microsoft to automatically determine which language to deliver the new OS in and whether you can support a 32- or 64-bit version. 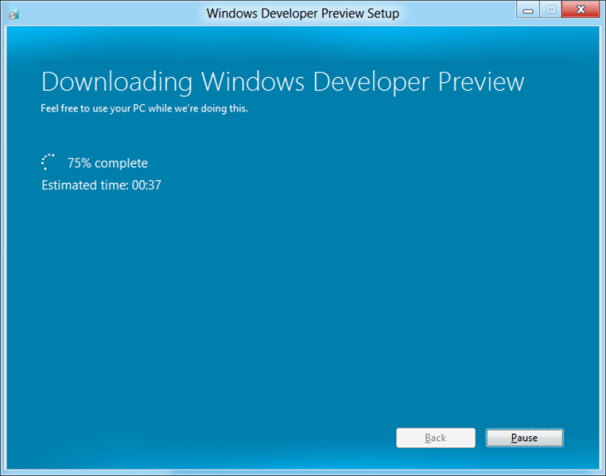 After that, Windows 8 starts downloading to your PC to complete the installation process. Once it's ready to go, you can choose to retain your complete Windows profile including your account settings, personal files and apps, or you can choose to keep just your personal files. You could also choose to keep nothing at all and start with an empty version of Windows 8. In general, Windows 7 users will be able to retain their apps, Windows settings, user accounts and files when upgrading to Windows 8 using the simplest upgrade wizard. Vista users will be able to keep their settings, user accounts and files, while XP users will only be able to retain their user accounts and files. Windows 7 upgrades required four different installation wizards including the Windows 7 Upgrade Advisor and Windows Easy Transfer and up to 60 screen clicks to complete. Microsoft says it has dramatically reduced the number of maximum screen clicks during a Windows 8 upgrade to 11. But whether cutting back on screen clicks will actually result in a faster and streamlined upgrade process remains to be seen.